The kids are back at school and the poplars are turning yellow so it's time for FOG to get back into the swing of things for another year. As with any arts group we belong to and workshops we might take, we end up with a plethora of neat samples, but rarely to anything with them. To that end we have come up with a Master Plan for the year and that is to do a book, using past samples as pages and altering them as we go. It was suggested that we think of a theme for our samples to create a more cohesive book. In June we will assemble our pages into a bound book. Not to be considered too strict in our approach and to avoid the Fibre Arts and Mixed Media Police 😉 we will spell off sessions and do some fun projects through out the year. As in the past where we worked with new products and techniques, we will continue to do that as we work on the pages of our book. 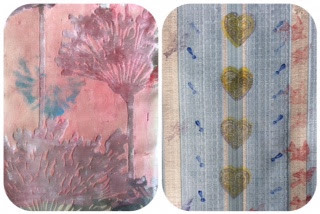 For September we altered pages and fabrics with paint to give them some new life. We did come up with some interesting samples. 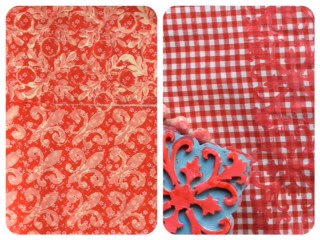 Just when you thought that your 1970's quilting fabrics (you all have them) were too ugly to use or that gingham might never be cool again, add some paint and a large rubber/foam stamp and you have created a wonderful new fabric ready for use. Diane - Vintage 70's red print and gingham prints. Off white and red acrylic paint with fabric medium. Fabric upholstery fabrics are also great to work on and they are a great size for a book. Betty - Two upholstery fabric samples. It's hard to see on the left, but the large flowers are very dimensional. I tried my hand on a piece of cotton, decorator weight fabric using both sides for much different looks. I used craft acrylic paints and fabric medium. Both foam and red rubber stamps seemed to work about the same. 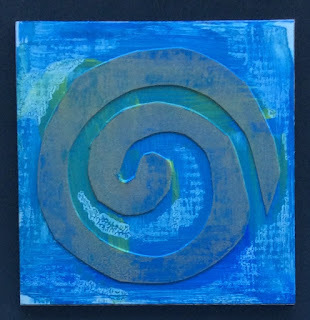 I used my Gelli Plate™ and brayered on the paint. 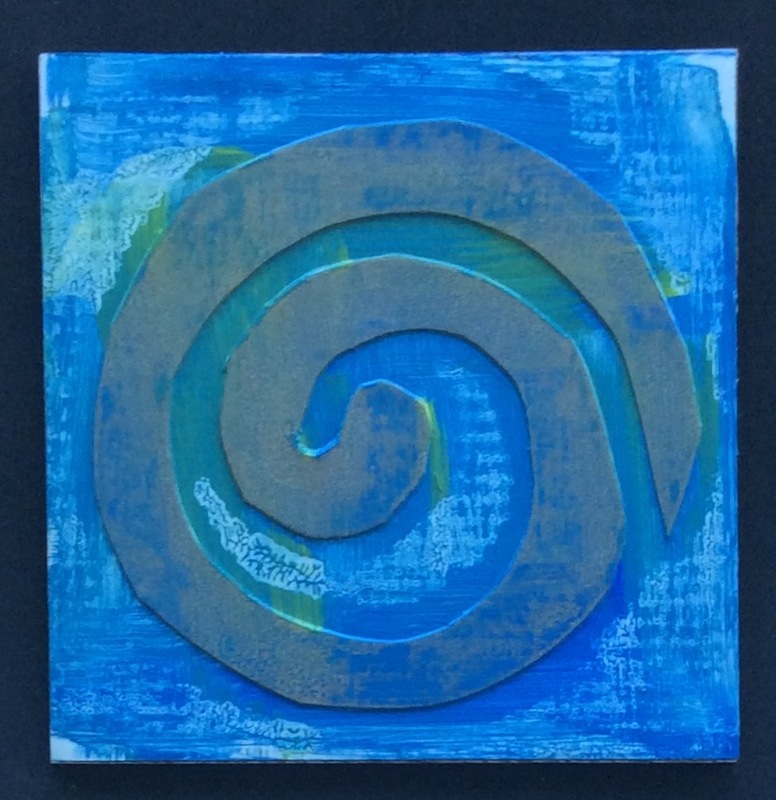 The slight give of the Gelli Plate™ allowed the paint to cover the stamps. Marie - Top - red rubber stamps. Bottom - wood block stamp. 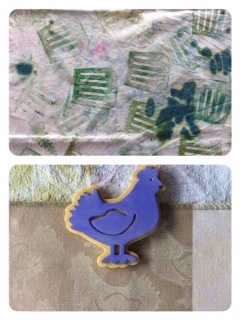 Marie used a foam brush to paint her stamps. Everyone uses a drop cloth or paper towel to paint on or clean up. 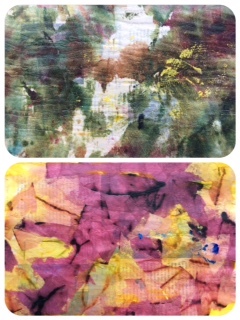 Karen took hers to the next level with some interesting stamps on her very colourful drop cloth. Karen - Paint splattered drop cloth and stamped images. Top - Joyce - using a spatula to print. Bottom - Meredith - Foam stamp on decorator fabric. Lastly, Karen gave us all one signature from a library discard book so that we can also work on another project throughout the year. While we were stamping we cleaned up the extra paint by brayering onto the pages or pulling a print from a Gelli Plate™. Karen - a couple of painted and altered pages. Top - painted paper towel, looks almost like netting. Bottom - Food colouring on coffee filters. I think it is safe to say that we had a good time for this first session and I look forward to the year ahead. We are to bring back one finished page to our next session in October. I must confess I have had a lot going on in my life through all of 2016 and the most of 2017 and have not been posting at all. We have continued to meet on our FOG Tuesdays throughout that time and I have diligently taken and edited pictures, but I have not headed down to the computer to do a posting. I hope that for the remainder of 2017 and into 2018 I will keep up with our current projects and might even get some of the old posts done as we did some very neat things throughout the year. 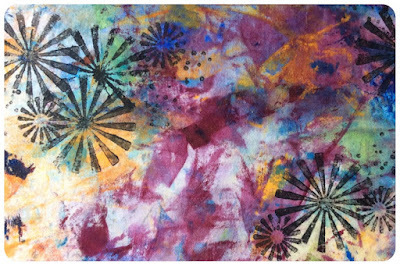 In June 2017, one of our members, a very talented artist in her own right, gave us a lesson on Abstract Art. This was quite departure for all of us and I must say that it was a learning curve for me. Mostly having done quilting, fibre arts and mixed media pieces over the past many years, abstract painting left me wide eyed like a deer in the headlights. I did learn that it was not best to scrimp with the paint and that abstract art can be a work in progress allowing layers to dry before adding new ones so you might want to work on more than one project at a time. Choice of tools can enhance your efforts and are certainly not limited to brushes. We had credit cards for scrapers, modified brushes, hand made stamps, drywall tape to name just a few. My efforts on one of the two pieces I started are show below. I have yet to compete either one. Left, first effort, scrimping on paint.Right, new layers, more paint, more interest. I walk each morning around the hood and always have my phone with me so I can take photos of interesting things I see. About a week ago I was on my walk and came across this table on the edge of a lawn and could not resist a photo. Abstract Art as its best. I marvelled at the artist, most certainly a young child, able to produce this perfect mess that could most certainly be hung in any gallery and there was likely no adult intervention in the process, just a childlike joie de vivre while messing about with some paint. I wish as adults we could capture some of that feeling. Sorry it’s taken so long to get this post onto the blog. Back in September we made Collograph Printing Plates (see the September posting below) and in October we used the plates to make mono prints. 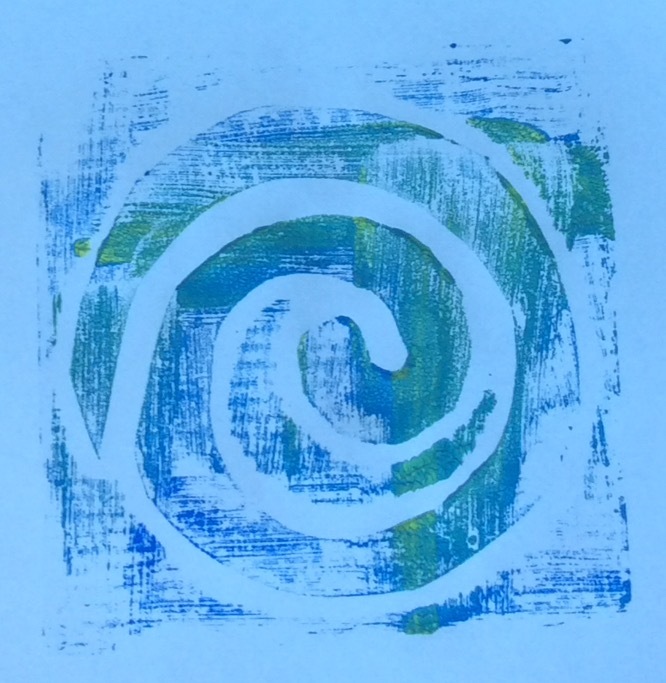 We learned several things in our October session, especially the items used to collage the printing plates themselves and how each behaved when printing with acrylic or fabric paints or the Speedball™ printing ink. Without a doubt, the simpler the collage, i.e. 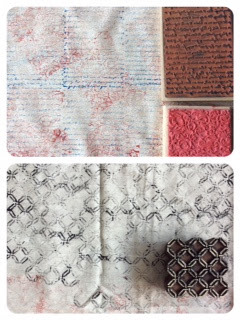 a single layer of cereal box cardboard or a thin crocheted doily, the better the mono print that resulted. As this was mostly a trial and error day, we used craft acrylic paint and copy paper for our printing. The second AH HA moment was that a more interesting print resulted when there were larger areas of open space between the elements of the collage. Not only did you get the printed image of the slightly raised area of the plate. In some cases you also got an imprint of the background area. We found differences in techniques for the actual printing depending on how you “inked” up your plate and how you printed it. If you inked you plate and had your copy paper on a piece of craft foam, you could use your plate like a rubber stamp, placing it face down onto the paper. This gave you the opportunity to evenly press on the plate to get a good print. 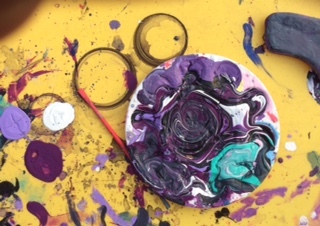 If you inked your plate and had it face up on the table, you could then place your fabric or paper face down onto the plate and use your hands or a spoon to work the ink onto the receiving surface. 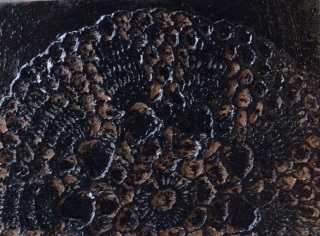 This is the technique that gave the best results of an imprint into the background areas of the plate. Adhesive craft foam on cardboard. Place mat made up of letters. 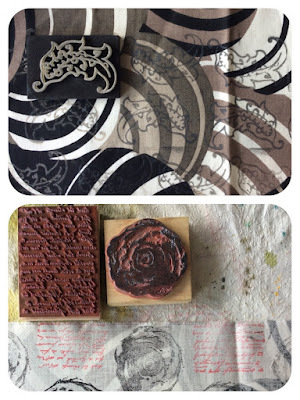 We did not come ready with the supplies for this last technique, but if you have access to an actual printing press, perhaps a Sizzix Big Shot™ or a flower press, it is apparently possible to use these devices to emboss damp paper using your collograph plate. That’s a technique for a long winter’s day. 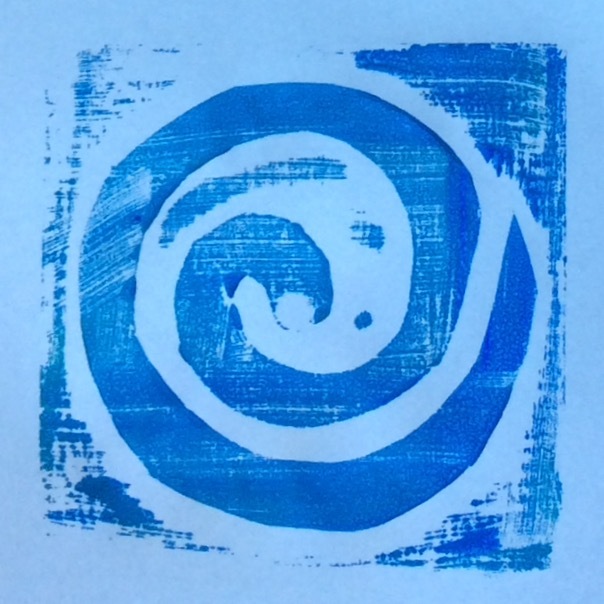 I personally liked the effect of printing using black Speedball™ Fabric Printing ink. I suspect we should have used a medium of some sort to make the ink slightly more fluid, but we brayered it onto a flat surface, pressed the printing plate into the ink and printed to our new surface. It is best to do a couple of dud prints first and then do your final print. Less ink gives a much better imprint. On some of the plates it seemed to work better to apply the ink directly to the plate working it in with a cheap bristle brush and then do your print. Here are two techniques that are very easy to do. The latter is not actually a collograph plate but gives much the same effect. This is certainly a technique that warrants some additional exploration, especially if you wanted to make prints that were entirely of your own design and making. Vintage Felt Stocking circa 1950's. 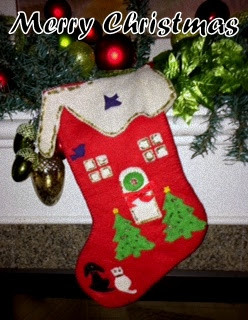 My first and only stocking. Thanks for joining us at FOG again this year. To start off our new year at FOG Tuesday we are doing a two part session. Part 1 in September is the making of Collograph Printing Plates and on FOG Tuesday in October we will be printing Collographs with the plates. A collograph printing plate, simply explained, is the creation of a collage of materials with interesting texture and relief on a rigid substrate and the resulting monoprint collograph is created when you apply inks or paints to the plate surface and print onto another surface such as fabric or paper. Little works of art in themselves. TL Corrugated cardboard, TR lace, buttons & cheesecloth. if you are using letters, make certain that you glue them on mirror image. If your items are a bit heavier, you may want to use the glue gun to adhere them first, and then do a layer of white glue. covered in the gloss varnish, did not take the paint very well. Once the collage is completed you want to let them dry thoroughly (we set ours out in the sun to dry), though you could leave overnight or use a hair dryer to speed up the process. Fruits of or labour drying in the sun. When the plates are dry, apply two thin layers of the gloss varnish to the front and back of the plate as well as sealing in the sides, especially if you are using cardboard as your substrate. The coating of gloss varnish seals all surfaces and provides a protective layer once you apply the wet medium you are using, paint or ink, and protects your plate for additional uses. More texture and letters placed mirror image. Left Zipper pieces and two layers of grunge board to even the layers. Top Right Adhesive foam shapes. Bottom Right Simple shape cut from cereal box cardboard. Top Simple cardboard plate, printed on fabric. Bottom Mirror image grunge board scrapbooking shapes. FOG Tuesday - We All Felt It! We have worked with commercial felt in past sessions, but in our session in May we focused entirely on commercial felt squares and the multitude of ways it could be manipulated, embellished, stitched and most importantly, how it distressed/melted with our heat guns. Felt comes in a variety of colours and also as printed or embossed felt. The printed felt is quite fun to use and adds an element of extra colour to the piece. We did not try embossed felt, but it is available at Michael’s here in Canada. If you are a little more on the diva side, felt also comes flocked and glittered. heat distressed and assembled with a brad. Add a pin backing and you have a great brooch to wear. Printed felt, stitched and heat distressed. One of the ways we altered the look of the felt before stitching and melting was with the use of commercial and handcrafted stencils and stamps. Gillian, several techniques on all pieces. Variations on a theme, Commercial flower stencil. from commercial, sticky backed foam stickers. If you want to maintain some structure with your piece before melting, you can stitch on the felt beforehand. This ensures that your piece will not fall apart. We tried both cotton and polyester threads and both seemed to work. If you own, or have access to a Sizzix™ or similar die cutting machine you can cut shapes with your Sizzix™ and then heat distress them with your heat gun. Both craft embossing and industrial heat guns work well, you just need to test beforehand how much heat you need to use to melt your felt. Leaves cut with a Sizzix die and then heat distressed. Many synthetic fabrics will distress/melt with a heat gun. While we mostly focused on the poly felt, by Kunin™ and Creatology™. Both are widely available at Michael’s and most of the dollar stores. Karen did try some polar fleece and it seemed to work very well. Karen, adding elements to a denim piece, left. Heat distressed polar fleece, right. Another way to embellish your piece is to print an image onto fusible web and then iron it onto your felt. Then you can be as creative as you want with stitching and heat distressing. Chris, Image on fusible web transferred by ironing to the felt, left. Stitched and heat distressed, right. While we were using the 9” by 12” inch squares of felt, I guess they really should be called rectangles J, felt is also availed in larger precut pieces and by the yard/metre off the bolt at your local fabric store. Just think of the possibilities with a very large piece of felt. ECO Alesrt! You should also feel good about using felt as a crafting item as it is mostly made from 100% post- consumer recycled and BPA-free plastic bottles and produces a high-quality fibre at a very modest price. All photos and blog posts are copyrighted. Watermark theme. Powered by Blogger.